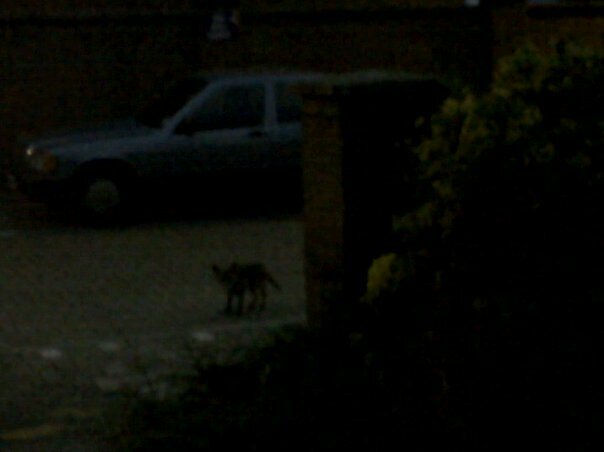 The photo above is a bit dark but then urban foxes do generally come out at night. This little one used to appear at times. I named him/her Roxy. Roxy was very shy and used to just look for rubbish. Someone has a sandwich business opposite me and occasionally little Roxy got lucky with some scraps. There are lots of cats around too and I did not hear anyone ever say that they were worried abou the cats’ safety. I saw Roxy walking past local cats and neither party seemed perturbed. They just accepted each other. Roxy never came into the house and would scamper off hurriedly if humans came along. The only time that he came close was when it snowed heavily last year. The door on my garden shed was ajar as it needs fixing. My daughter went in to get a shovel and saw what she initially thought was a ginger cat asleep in there. But it was Roxy. I did not mind at all. In fact, I was pleased that he had used the shed for shelter. He stayed there for a few nights. He would come out on the patio in the morning, yawn and stretch and then jump onto the fence and wander off on his daily business. As far as I know he left the street on those occasions. He passed cats and they once again ignored each other. When the weather improved, Roxy did not come back. Sadly I haven’t seen him/her for about a year. I want to tell you about another fox encounter that I had which showed another side to urban foxes. I came home alone after being at a Spring celebration with friends at the end of March one year. I got off the bus at about 12.30 am and the street was quiet and largely deserted. I have to walk about one hundred yards to a road that adjoins mine. There are some brick walls at the top of the intersection. As I stepped off the bus I noticed two figures sitting on the wall. The bus went off and they saw me. One jumped down and started turning his head, looking up and down the street and then he looked at me and the other jumped down. They were both heading in my direction and looking back and forth and up and down the road. My survival instinct went on red alert and I quickly dived down a side turning and stood motionless against a wall, trying to blend in and look invisible. I looked accross the narrow road and saw red flashing eyes, A fox was there, also motionless watching me. The feeling of danger was proven not to be my imagination as the two figures came running along the road that I had abandoned and they were cursing and spinning around looking up and down. For some reason they did not turn into the side road and did not see me. I do not think that they realised that I had clocked them. I stood there, still as a statue whilst they raced up and down for a while. I kept my gaze locked with the red eyes of the fox, hardly daring to breathe. It stood there too. The foosteps gradually died down but I did not feel safe to leave my hiding place for a while. I stood motionless for a long time and I retained eye contact with the fox. I was using him/her as a barometer as they have a greater range of senses than us. The fox eventually broke eye contact and ventured out and turned out into the road. It looked up and down and then looked back at me and trotted off to the other side of the street. I knew then that it was safe to come out. I hurried along the now deserted street and crossed the road and ran down to my street. The fox was ahead. It stopped and turned round once to watch me. I shouted thanks to it and went home safely. It would be horrific of course, if you or your child did have the misfortune to be attacked by a fox. From what I know of foxes and have seen of them, it would be a very rare occurrence as foxes steer clear of people. The recent moral panic about urban foxes going around in gangs and getting out of control in urban areas sounds to me like a Tory strategy to win the hearts and minds of the public for reintroducing fox hunting for their countryside mates. I will always defend foxes. We invade their habitats to build our homes and we are so greedy that we do not eat all of the food that we buy so we throw it away. I personally am glad that some creature, fox or otherwise is eating our scraps, especially when there are so many people starving in the world. This entry was posted in Animal Work, Foxes and tagged animal welfare, Fox, Foxes, League Against Cruel Sports, Urban fox, Urban foxes. Bookmark the permalink.